All of our replacement Marvel 81 Band Wheels are"Always In Stock"
Band wheel (1 1/4' blade) for machines with planetary gear boxes. 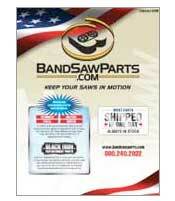 Upper and Lower Band Wheel (1" blade) for Marvel 81 band saws. Upper Wheel Bearing for D series 81 which take bandwheel shaft P AB 81-BB7. Upper and Lower Band Wheel (1 1/4" blade) for Marvel 81 Band saws. Spring for Hydraulic ratchet nut. Allows Vise Assembly to Release when turned off. Hydraulic Ratchet Nut O Ring Seal Kit is used to repair leaking vise clamps. The Ratchet Key is a hardened steel insert which fastens to the end of the ratchet nut (P AB 81-ABR3). It allows the ratchet nut to lock into the table for vise clamping. Mounts on End of Hydraulic Ratchet Casting (P AB 81-ABR3-SA) Sealing Piston Rod and Shaft. Rubber Hydraulic line for vise ratchet nut. The Spring Reel is located in the shuttle table. It keeps tension on the fabric cover which covers the shuttle ways between the shuttle and the saw vise base. The Fabric Cover is located on the shuttle table. It covers the shuttle ways between the shuttle and the saw vise base. Quick Connect Coupling (Male) for vise Hydraulic line. Quick Connect Coupling (female) for vise Hydraulic line. Ratchet Mount on one end Idlewheel Casting and Tension stop Mounts on other end. Pressure Plate Assembly 1-1/4 or Carbide Back Up Guide supports back edge of saw blade. This blade guide has three carbide pads it fits on a dove tail. The machine requires two pieces of P AB 81-BD206-A and two pieces of P AB 81-BD207-A. It is recommended to replace all Four. This blade guide has three carbide pads it fits on a dove tail. The machine requires two pieces of P AB 81-BD207-A and two pieces of P AB 81-BD206-A. It is recommended to replace all Four. Dove Tail Clamp for side guides P AB 81-BD206-A and P AB 81-BD207-A. This guide will fit Older Marvel 81 machines with 45 Degree Blade Guides (Left or Right) (4 Per Machine). Pressure Block Assembly or Back Up Guide for D-Series 81 with 1 1/4" saw blades. Blade Guide Holder Assembly or Side Guide for Marvel 81/11. Pressure Block Assembly or Back Up Guide for D-Series 81 with 1" saw blades. Primary Drive Shaft for Chip Brush Assembly. This gear is used on chip brush units powered by the transmission flywheel. Each unit takes two Miter Gears. Also known as Miter Gear 8-1130. Intermediate Drive Shaft for Chip Brush Assembly. This Bushing is used on chip brush units powered by the transmission flywheel. Each unit takes three Bronze Bushings. This Bushing is used on chip brush units powered by the transmission flywheel. Each unit takes one Bronze Bushing. Also known as a blade brush or wire wheel. The Chip Brush removes shavings from the saw blade teeth to increase production and blade life. Bronze Bushing for chip conveyor idler sprocket. A centrifugal pump which supplies coolant to the saw blade. Also recommended is the P AB 81-DBR6-C intake screen. A wire mesh screen or strainer that clears debris from coolant before pumping. Solenoid Valve for Marvel 81 located on coolant pump. Turns coolant on and off electrically. Replacement screen for P AB 81-DBR6-C.
Micro Switch or Limit Switch located on band speed junction box. This switch sets minimum and maximum band speed. This switch is operated by the forward and reverse control rod. It is located in the Hydraulic compartment. Limit Switch or Broken Blade Switch located in upper saw head. For the 81 PC controlled saws. Out of Stock Limit Switch located on shuttle vise cylinder. Limit Switch located on rear of shuttle actuated when shuttle is at rear position. Start Push Button for Marvel 81/8. Stop Push Button for Marvel 81/8. 2 Position Selector Switch for Carriage(stop fwd./auto ret. ), Blade(stop/run), Coolant and Work Light(on/off) for Marvel 81/8. 3 Position Selector Switch for Power Tilt(left/right) and Blade Guide Arm(up/down) for Marvel 81/8. Green Start Push Button for Marvel 81/8. Contact Block for 22mm push button and selector switches used on Marvel 81/8. Green Start Push Button for Marvel 81/9. Stop Push Button for Marvel 81/9. 2 Position Selector Switch for Carriage(stop fwd./auto ret. ), Blade(stop/run), Coolant and Work Light(on/off) for Marvel 81/9. 3 Position Selector Switch for Power Tilt(left/right) and Blade Guide Arm(up/down) for Marvel 81/9 - 81/11. 2 Position Selector Switch for Shuttle Manual Control(rev./fwd.) used on Marvel 81/9. Contact Block for 22mm push button and selector switches used on Marvel 81/9. 3 Position Selector Switch for Table Selector(left,both,right) for Marvel 81/9. Green Start Push Button for D-Series Marvel 81. Contact Block for 30mm push button and selector switches used on D-Series Marvel 81. Selector Stop Push Button for D-Series Marvel 81A automatics. 2 Position Selector Switch for Auto Stop (on/off) used on Marvel 81A/11. 3 Position Selector Switch for Table Direction(left/right) for Marvel 81/9. Out of Stock Selector Switch for Marvel 81A/9-81A/11. 2 Position Selector Switch for Gauge(clamp/release) on Marvel 81/9-81/11. Fused 30amp Disconnect Switch located on electrical control panel for Marvel 81/8. Coupling for Main Pump (P AB 81-CA17). These couplings prevent damage to the pump due to misalignment or vibration of motor shaft. Connects Electric Motor to Hydraulic Pump. Timing Belt which is used to rotate feed pump (P AB 81-CAS22) on D-Series Marvel 81. Hydraulic Pump located in rear of Hydraulic compartment. This pump is ran by a timing belt. Also known as P AB 25-CA25. Timing Belt for machines with pump P AB 81-CA332. Liquid Level Gauge or Fluid Site Glass used on Hydraulic compartment for Hydraulic fluid level. Suction Strainer located in Hydraulic tank that prevents the Hydraulic pump from sucking up debris. Filter Element for in tank filter unit. Main Hydraulic Pump for band speed. This pump is driven directly from the Hydraulic pump motor. Auxiliary Hydraulic Pump for D-Series Marvel 81. Driven Via a Timing Belt. Flow Control Valve located under table, used to adjust speed of clamping vise. The Needle Valve Assembly controls the feed rate of the saw head. It has a micrometer style knob for precision adjustment. This is a cartridge style filter element which fits in the P AB 81-CB49 filter housing. Spin on Hydraulic Oil Filter located in Hydraulic compartment next to oil cooler. Cylinder Seal Repair Kit for Shuttle Cylinder. Lower Bandwheel Shaft for Hydraulic driven gear box. Bearing Locknut or Spanner Nut used to retain bearings on upper bandwheel shaft. Bearing Lockwasher used on upper bandwheel shaft. Roller Bearing for the gear box output shaft P AB 81-BB208. Tapered Roller Bearing for input shaft located on balancer side of the transmission. Tapered Roller Bearing for input shaft located on Hydraulic motor side of the transmission. Output Shaft Seal or radial lip seal for lower bandwheel shaft. Oil Seal or radial lip seal for input shaft of gear box on the flywheel side. This Sight Glass or oil gauge helps maintain transmission oil level.